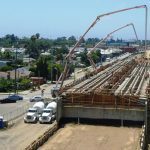 Mountain Pacific, Inc., working as sub consultant to Jacobs Engineering, is providing bridge design services on Construction Package 2-3 of Dragados-Flatiron Joint Venture design-build contract for the California High-Speed Rail. The 1.2-billion design contract awarded to Jacobs includes 65 miles of construction and infrastructure improvements for the initial construction segment of the high speed rail system linking San Diego to San Francisco with operating speeds of up to 220 miles per hour, the high speed rail will be one of the biggest infrastructure projects in California’s history. Design and construction will include are 32 roadway separations and 23 high-speed rail structures, in addition to 10 million yards of embankment.